Sept. 12th, 2007 : Water Temp. 83* and falling. 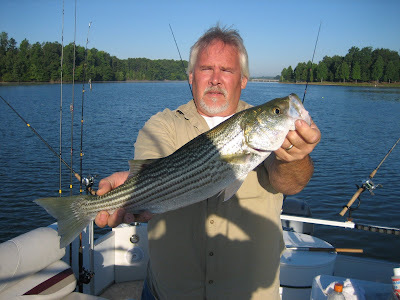 A cold front blew threw last night and finally we may start to get some cooler water temps which will turn the Stripers on. I caught both Herring and Gizzard Shad this morning and ran the Gizz on 8 planner boards and a Bobber while running the Herring on 7 downlines. 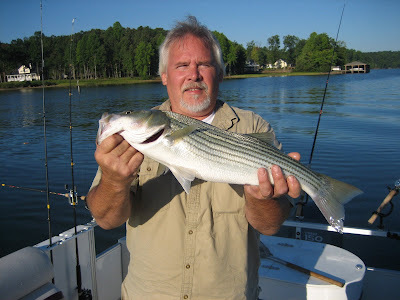 I kept Bobby busy going from rod to rod but he handled it well, catching a dozen Stripers releasing them all. The cold front probably did not help the fishing today but the forecast is calling for much cooler weather for the next couple of weeks, surely pushing the bait to the banks and to the backs of the creeks.